With our nightly temperatures beginning to dip closer and closer toward our first frost, we're taking advantage of one summer garden vegetable that is still producing well, okra. It's one garden vegetable I can always count on to produce faithfully until frost kills it. Also known as "gumbo," this African native grows well here in the southeast, requires little care, and produces tons of edible pods. The pods freeze well without blanching, and can be eaten in a variety of ways. The seeds are easy to save. There are some objections to it however. When cut, the pods release a soluble, mucilaginous fiber, which gives the vegetable a characteristic "slimy" texture. Because of this, okra is often used to thicken soups and stews, like gumbo. It's also enjoyed slime and all, either stewed by itself or with tomatoes. Not everyone cares for that mucousy texture however, and there are ways to minimize it. A popular restaurant offering is fried okra, where the chopped pods are breaded and deep fried. The pods can also be cooked whole, in fact sometimes I roast them in the oven this way. Pretty tasty. Our favorite way to eat okra is probably fried, but I rarely, if ever, fry foods. This is mostly because of the amount of fat or oil required for deep frying. Plus it seems like a lot of trouble when there are so many other tasty ways to prepare food. Our second favorite way is sauteed, and here's how I saute okra while minimizing the slime factor. Washing freshly picked okra pods. Okra has to be picked while the pods are still tender. They grow quickly so this is an almost daily task. If I don't have any fresh, I grab a quart out of the freezer. It needs to at least be defrosted enough for the slices to separate. Chopping with onion. Garlic is good too. I slice them and chop up some onion too. Fresh garlic is excellent to add, but if I don't have any of that, I might add garlic powder. Cook together in the fat or oil of your choice. I like to cook this in one of my cast iron skillets. I either use olive oil, or bacon fat if I have it. As it cooks, wet "strings" form between the pieces. This is the stuff folks don't care for. When this starts to happen, I start sprinkling it with fine corn meal, corn flour actually. I stir it in and keep on sprinkling until the pieces are dry with no strands. The corn flour browns and cooks with the okra and onions. The end result is more like any other sauteed vegetable, rather than a slimy mass. Season with salt and pepper to taste and dig in. Definately an acquired taste. Major "yick" factor that I just can't get past. SM will eat it fried but (like you) I rarely fry anything, so it's a NO in my garden. 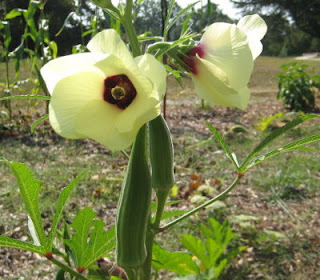 It is amazing to see all the locals around here blooming with the okra flowers, though. The flowers look like Rose of Sharon. My grandmother used to fry them when I was a kid, but I haven't had them since. I love fried ocra. But sauteed okra would be much better for you!! I'll have to buy some in the grocery store and try it your way. If we like it -- then I'll have to grow some next year!! Thanks for sharing! That's a new twist on Okra for me! I have to try that recipe...I usually use all those ingredients except cornmeal, I add tomatoes then serve on top of rice. I am one of the no like the okra camp. I just can't get past the slime. But your right it is a very prolific plant with beautiful blooms. Tami, it is an acquired taste. Besides frying though, roasting whole pods or cooking as per this recipe nullifies the sliminess. Really! Benita, it's kin to the Rose of Sharon. I'm thinking of planting them in the front yard next year! Suzan, I came up with using cornmeal in an attempt to imitate the fried okra flavor without frying. It doesn't exactly, but it absorbs the mucous! Ginny, with tomatoes on rice sounds good too. I canned some okra and tomatoes this year, so I'll have to try them on rice. Jane, we don't like the sliminess either, hence the recipe. Since it grows so well here though, I figure we'd better learn to like it! Being a northerner, I've never even tasted okra . . . nor can we grow it up here so far north. Sure does have beautiful flowers! Just out of curiosity, what does it taste like? But I love your tip there. I'm not sure that I'll cook some up for just me though. sigh! Okay, I'll have to admit that I'm one of those "no way!" to eating Okra. However, before retirement, there was a sweet young woman from Oklahoma who said her gramma made the best fried okra ever, she couldn't believe I didn't care for it. So, Leigh, you might have convinced me to at least try it one more time with your method of cooking it and ridding it of its slimy-ness! Okra is a veggie we just don't normally see around here. I've probably seen it in grocery stores or markets only 3 or 4 times, ever. The one time I tried a gumbo soup was in a restaurant, when out with a friend. We split the soup as it was new to us. Forget the slimeyness, we couldn't get passed the burnt smell and horrible taste. Now that I live in a small community again, exotic veggies are rarely seen here. I think Okra is a beautiful plant. Growing up in the South, one cannot get away from okra, so I was forced to eat it. I like mine fried too, but like you, I don't fry foods often. Using the corn flour is a nice trick to know since I am one who does not like the mucousy discharge. Until a few years ago, I have always hated okra, but after having it at the home of an Indian client of mine, I became a convert. She stir-fried hers at a high heat with a little oil and then seasoned it with spices (curry, cumin, garam masala). It was delicious and not slimy at all. She said in India they call Okra, Lady Fingers. Leigh, my dad was just asking about his okra - the underside of the leaves are covered in tiny black and white specks. I've never grown okra, but I know it grows well here in Hawaii. Mmmm, I love okra! Another way to cook it that leaves it un-slimey is to grill it. Just toss it with olive oil, salt and pepper and grill until it begins to char a little. I'm guessing it's similar to your roasted version, but without heating up the oven in summer. Mama Pea I was in the same boat until I moved to Louisiana. The food there changed my culinary life forever! Always preferred fried okra, but since it grows so well, I'm forcing myself to expand our uses of it. The cornmeal during sauteing does help. Renee, you sound like me! Hard to cook for only self, isn't it? CaliforniaGrammy, do tell me what you think! It does seem to take a lot of corn meal to "dry" it up, but you don't really taste it. Roasting whole pods also helps, also see The Weekend Homesteader's and Kari's recipes below! Nina, yuk! The burnt smell was definitely not the okra, but the cook! Okra has a subtle grassy smell, I think. The taste could be credited to the cook as well, because in soup or gumbo, it's not a predominate flavor. Linda, let me know what you think! Candace, it's true, its ubiquitous in the south, though I know it grows in other parts of the world. The Indian Lady Fingers sounds like a great recipe! I will definitely have to try it, because I need more ideas for cooking with it. Nancy, I haven't a clue about that. My okra is one of the most disease free plants in my garden. Does Hawaii have a cooperative extension office? That would be my number one resource. Kari, grilled okra sounds wonderful! It probably is like roasting, but who doesn't love grilled food? Leigh - we LOVE okra and enjoy it many ways, and am looking forward to trying your recipe. This looks delicious! One of our new (favorite!) ways to eat okra this year is to toss with a little olive oil (add salt too, we're just cutting back on salt) and grill whole. The pods need to be the smallest and most tender and oh my goodness gracious this is really good. I think the grilling might address the 'sliminess' issue a little and gives it great flavor. BTW...I love your colorful "popcorn" background on your blog. Very striking and pretty. Whoops - I just realized I repeated Kari's comment. I hadn't read everything before I wrote mine. She is right though...! Wow, that's a lot of okra. This is the first year I tried it myself. A friend got me some seeds this spring and I put them in an 18" pot on the patio. About six came up and I think I got bloom on two of them. Never saw a pod. Potting soil must be the worst thing yet for okra, ha ha. I'm glad you got a good haul! Lisa, thanks! Ya'll's idea for roasted okra sounds wonderful. Any vegetable seasoned with olive oil and salt is always tasty in my book. Andrew, I'm surprised you didn't get a better yield. I wonder if they got root bound (?). They do get pretty tall. It's a great producing vegetable. I did not really know about Okra and now I do. Thanks for taking the time to do such a great post with pics nonetheless! I'll be honest, I've always been nervous to even try ocra! I had no clue how to prepare it, or if I would like it at all. When you can them are they still slimy? Bney, for a first time, try fried okra! No sliminess and everybody loves it. The key to reducing the mucous is to not cut the tops off the pods but cook them whole. They need to be small to be tender. Roasted is good, and several folks have recommended grilled, which sounds yummy. In my sauteed recipe, the corn flour absorbs the mucous, so no slime effect. I've only just canned okra for the first time this year, so I'll have to let you know how slimy it is. We've tried the pickled okra, which is delicious, and not slimy as much as slippery. As a thickener in soups, the texture is smooth, not slimy. I think the same is true of stewing it with tomatoes, but again, I'll have to let you know about these two! Oh how I love Okra...thanks for sharing. That's the first thing I'm going to plant when we get our gardens built (at least that's what I tell myself on the blog, lol). Love your blog by the way! 1st Man, thank you! And welcome! Getting gardens ready to plant is an exciting and hopeful endeavor. I imagine you'll have all sorts of good things to plant. Wow, I've got to try okra this way. I'm an okra fan when it's fried or cooked in something, but I never could stomach sauteed because of the slime factor. I'll give it a try!